Very few trees are completely disease-free, so it’s no surprise to learn the existence of diseases of chestnut trees. 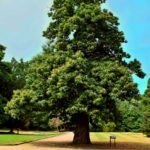 Unfortunately, one of the chestnut diseases is so serious that it has killed off a large percentage of the chestnut trees native to the United States. For more information on chestnut tree problems and tips on treating a sick chestnut, read on. Blight – One of the most deadly diseases of chestnut trees is called blight. It is a canker disease. The cankers grow fast and girdle branches and stems, killing them. The noble U.S. native, American chestnut (Castanea dentata), is a huge, majestic tree with a straight trunk. The wood is beautiful and highly durable. Its heartwood can be counted on in any situation where decay is a potential risk. American chestnut trees made up about half of all eastern hardwood forests. When blight reached this country, it decimated most of the chestnuts. Treating a sick chestnut is not possible if the problem is blight. European chestnut (Castanea sativa) is also susceptible to these chestnut diseases, but Chinese chestnut (Castanea mollissima) is resistant. Sunscald – One of the chestnut tree problems that can look like blight is called sunscald. It is caused by sun reflecting off of snow in winter and heating the bark on the south side of the tree. The tree erupts in cankers that can look like blight. Use latex paint on the tree trunk to prevent this issue. Leaf spot and twig canker – Both leaf spot and twig canker are other chestnut diseases that can damage these trees. But in comparison to blight, they can hardly be viewed as significant. They should be categorized as chestnut tree problems rather than chestnut diseases. Leaf spot presents as small spots on chestnut leaves. The spots are colored yellow or brown and have concentric rings in them. Sometimes the colored area falls from the leaf, leaving a hole. Sometimes the leaves die and fall. Treating a sick chestnut with leaf spot (Marssonina ochroleuca) is not recommended. Let the disease run its course. It is not one of the chestnut diseases that kill trees. Twig canker (Cryptodiaporthe castanea) is not one of the chestnut tree problems that you have to stay up nights worrying about either. But it is a little more serious than leaf spot. Twig canker attacks Japanese or Chinese chestnuts. The cankers girdle whatever area of the tree they appear on. Treating a sick chestnut with twig canker is a matter of pruning out the infected areas and disposing of the wood. Read more articles about Chestnut Trees.